garvey cey russell lopes: the first 30 homerun foursome and the 1978 topps record breaker card that should have been! 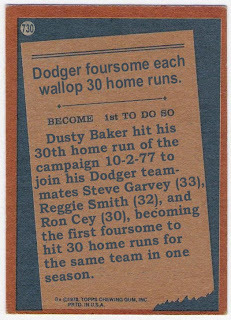 the first 30 homerun foursome and the 1978 topps record breaker card that should have been! ok, so lou brock broke the record for most lifetime stolen bases, pete rose set the record for most career hits by a switch hitter, and sparky lyle set the record for most relief appearances in a career, but for topps to comemmorate such things as most consecutive seasons with one team (brooks robinson), most homeruns in one world series (reggie jackson), most times hitting 2 home runs in one inning in a career (willie mccovey) and most games with 10 or more strikeouts in a career (nolan ryan) with a 1978 record breaker card, but overlook the feat of the dodger foursome of steve garvey, reggie smith, dusty baker and ron cey was just plain wrong. all they did was become the first set of four teammates to hit 30 homeruns in the same season. i mean, reggie was already going to be on the world series recap card. why inundate us with another yankee card? I love cards that should have been! Well done on the '78 Topps! Hello Topps, Hello! !....Archives need to be part of your many fine releases!!! Hello.....anyone?....... Bueller? You fooled me!!! I saw this and thought "Man, I have never seen this card. We got ripped off in the OPC set..." Great job! whither nomar? the cards that should have been! even more dodger stadium shots! forsch brothers through the mail success! rick monday in person/through the mail success! joe pignatano through the mail success! let's play what's the connection? frank tanana through the mail success! jimmy key through the mail success! tommy john in person/through the mail success! where would this rank on the 'beard-o-meter'? bob gibson really was intimidating! greg gagne through the mail success! more cards from dodger stadium! bob lillis through the mail success! josh hamilton through the mail success!